To see the full painting click here. Water directly benefits the Sacramento Valley's highly productive agricultural enterprises, which support the region's economy and communities; The Valley's water resources need to be managed to ensure that existing economic, social, and environmental systems endure indefinitely. The connection between the economic sustainability of Sacramento agriculture and water quality is ingrained in the legacy of family farmers who settled the Sacramento Valley generations ago. 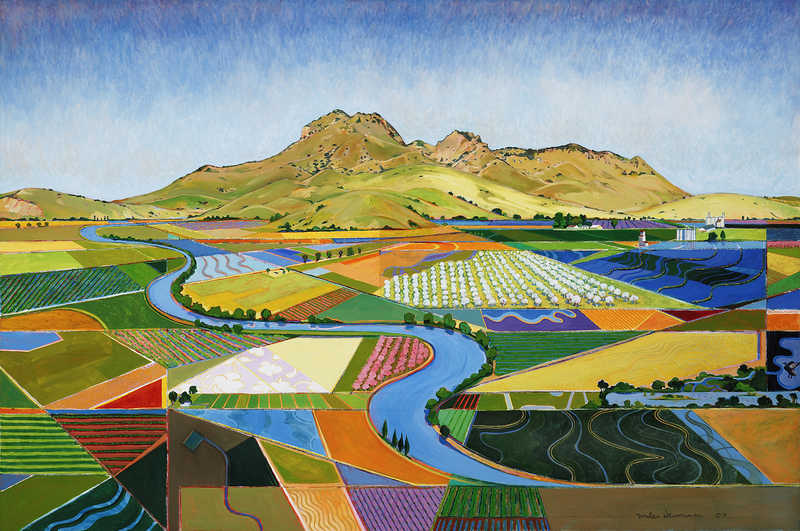 So in 2003 it was a logical extension of the Northern California Water Association (NCWA) mission to partner with over 200 agricultural representatives, natural resource professionals, wetlands managers and local governments throughout the region to improve water quality for Northern California farms, cities and the environment. The mission of the Sacramento Valley Water Quality Coalition (Coalition) is to enhance and improve water quality in the Sacramento River Basin, while sustaining the economic viability of agriculture, functional values of managed wetlands, and sources of safe drinking water. The Coalition is composed of more than 8,600 farmers and wetlands managers encompassing more than 1.1 million irrigated acres and supported by local farm bureaus, resource conservation districts, County Agricultural Commissioners, and crop specialists with the University of California Cooperative Extension. Since the submittal of the Regional Plan for Action in 2003 the program has evolved significantly to reflect the regulatory priorities (e.g. groundwater quality) and initiatives (e.g., Basin Plan amendments) of the State Water Resources Control Board and the Central Valley Regional Water Quality Control Board (Water Board). From the submittal of the first Monitoring and Reporting Program Plan (MRPP) in April 2004 to the development of the groundwater quality assessment report for the Sacramento Valley, the Coalition and its thirteen (13) Subwatershed Groups have successfully maintained regulatory compliance for growers in an equitable and cost effective approach. To effectively implement the Irrigated Lands Regulatory Program (ILRP) the Coalition and 13 sub-watershed groups signed a Memorandum of Agreement that defines the respective roles and responsibilities of the Subwatershed Groups, as well as the Northern California Water Association. Additionally, the Coalition signed a Memorandum of Agreement with the California Rice Commission to coordinate the respective programs in the Sacramento River Basin. Water districts and companies have encouraged landowners to join and have assisted in grower education through newsletters and information updates. The Coalition is continuing to pursue partnerships with municipalities and urban areas in the region that are developing stormwater management plans and facing increasingly more stringent effluent limitations. Several refinements of the ILRP by the Regional Water Board have necessitated changes in the program during the last decade. The first of those occurred in 2009 when initial results from surface water quality monitoring enabled the Coalition to secure a more focused monitoring program. The Regional Water Board approved a five year Coalition specific MRPP that focuses surface water quality monitoring and analysis on the pesticides, herbicides, nutrients and other agricultural products specifically used in a Coalition Subwatershed. In 2011 the Regional Water Board approved a significant expansion of the program for growers throughout the Central Valley that added groundwater quality to the ILRP. Over the three years the Coalition worked actively to craft a program that delineates the Sacramento River Basin from other agricultural regions of the Central Valley. As the ILRP requirements expand to include groundwater quality, the Coalition is proactively implementing foundational actions necessary to compile and characterize existing groundwater quality data, identify and prioritize areas to undertake special projects to improve groundwater quality and to implement a plan of action to improve groundwater quality. What is A Water Quality Coalition?